It was actually a bit by accident. During the fitting, I realized it looked kinda cool without the sides sewn up. So I left it as is. It's cute, yes? Instead of a bra, I went with a simple white bandeau since the sides are completely open. I put on my high waist jeans and some wedges and was off. A minimal outfit that is just outside of "basic". So for the warmer weather days, this is a creative alternative to jeans and tee. This is gorgeous, I've just taken up dressmaking courses and would love to make a top like this. Did you use a paper pattern? I love the backdrop and of course the outfit. I love stripes and heels make it look fab! Love your self made shirt. It looks great with your high waisted jeans. You have no idea how much I needed a fabulous stylish blog - from another curly headed girl. 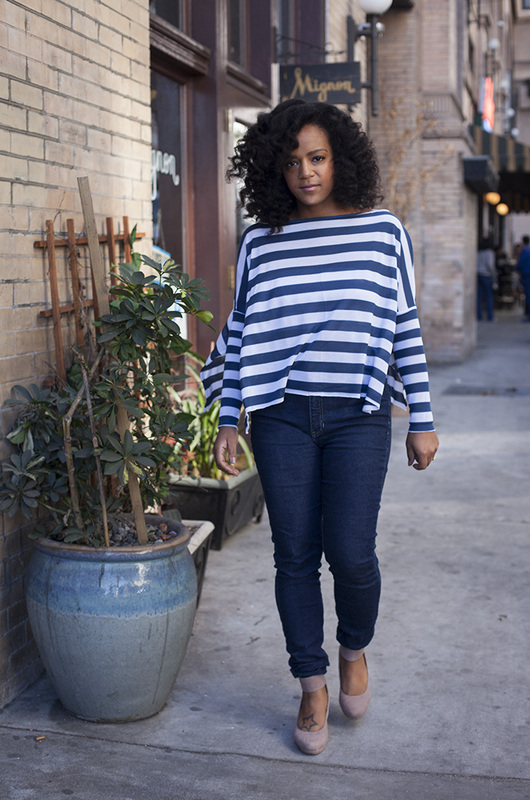 It's so refreshing to see fabulous curls and fashion thrown into my list of blogs I follow. Can't wait to see what else you'll share! I think "just outside of basic" is the perfect way to describe this outfit. The open sides and visible bandeau add a touch of something different -- love.